The Company “MARCO MASSETTI”stands out for years for the original design, a sophisticated style that is constantly renewed, following the desire of those who love a DISTINCTIVE LUXURY. Initially as a design studio, then as a “Luxury Fashion Brand” so was born brand “MARCO MASSETTI” which is a project of the highest level and high craftsmanship. From the simple feature of a pencil it takes to shape the idea in order to become symbol in the time. Individual pieces, the result of a meticulous study of trends, news and the most appropriate solutions that contain CLASS, STYLE AND UNIQUE ‘; Uniqueness that is expressed with sandals and clutches adorned with precious stones and precious materials. All materials used are certified and strictly Made in Italy, because the label “MARCO MASSETTI” would never miss the comfort of the shoe which are meant to combine beauty and practicality. … Of the finest quality leather, mink, swarovski stones, natural stones and accessories completely made up and welded by hand by master craftsmen. 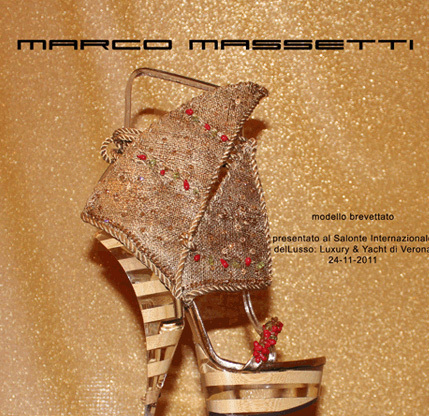 For years the shoes signed “MARCO MASSETTI” is worn by international characters in television programs in both Rai and Mediaset, important events, world-class show, women elegant and sophisticated, attentive to detail and ready to wear a real SANDAL JEWEL. The label “MARCO MASSETTI” second to none as to inventiveness and originality. He impressed the most important trade fair in Vicenza goldsmith’s and Cremona international presentation of the new car ENZO FERRARI, featuring a sandal,with the entire upper 18 carat gold and Mediterranean coral, carved meticulously by hand by expert goldsmiths, hence, the GOLD LINE, which includes a wide variety of natural stones and inlaid work in the upper, as a symbol of luxury and Italian design. Experience a new work of embroidery, used in clothing, but never in the footwear, with new combinations of colors and materials carefully treated with innovative techniques. Limited collections, dedicated to women who are enveloped by romance author of a poem. A design that holds a mystery of these precious goods that evoke images of enchanting places with the use of materials, able to recall the warmth and energy to live an instant.